Almost all strains of marijuana can be grown outdoors, however, some strains are better suited to the changing conditions that naturally occur, than others. It’s an advantage for the plants to flower and mature quickly, ideally commencing in the later part of the Summer, giving the plants ample time to fully bud and ripen, before the colder night-time temperatures of the Fall. Completely feminized, each seed is guaranteed to germinate, producing a strong female plant, with easy growing characteristics, suited to outdoor growing conditions. Enjoy variety from your labors, with three exciting strains, each offering a different flavor, taste and high. Super savings compared to individual pack purchases. Amnesia Haze – Produces a sociable and energizing high from it’s aromatic, lemon citrus flavored buds. Super Skunk – Fast to mature and perfect for beginners, generating good yields of pungent, sweet tasting buds with a relaxing high. OG Kush – Highly respected American strain with it’s own unique signature flavor of earthy pine and sour lemons. 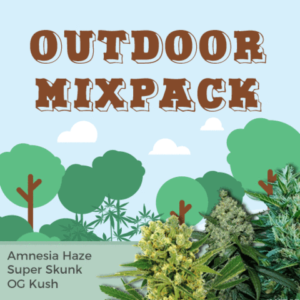 These strains are better suited to the changing conditions that naturally occur outside.